The battery is discharged if battery check lamp 1 does not light up briefly. ■ Change the battery . You can get a battery at any qualified specialist workshop. ■ Press mechanical key 2 into the opening in the SmartKey in the direction of the arrow until battery compartment cover 1 opens. Do not hold battery compartment cover 1 closed while doing so. ■ Remove battery compartment cover 1. ■ Repeatedly tap the SmartKey against your palm until battery 3 falls out. ■ Insert the new battery with the positive terminal facing upwards. Use a lint-free cloth to do so. ■ Make sure that the surface of the battery is free from lint, grease and all other forms of contamination. ■ Insert the front tabs of battery compartment cover 1 into the housing first and then press to close it. 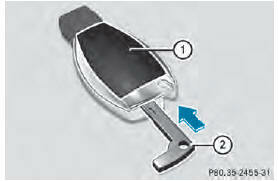 ■ Insert mechanical key 2 into the SmartKey. ■ Check the function of all SmartKey buttons on the vehicle.